Suppose a group of exposition amateurs produced an audio show. What do you think would happen? 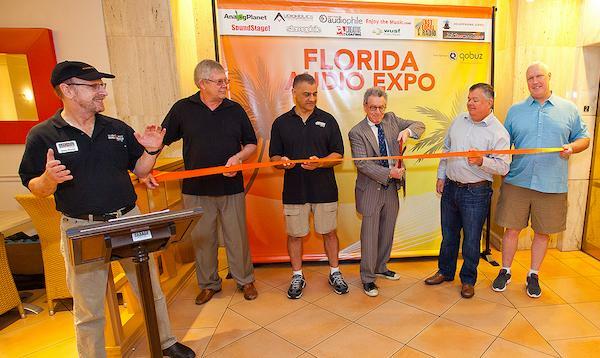 The crew that created last week’s Florida Audio Expo had no show producing experience and did not know what to expect when they went into this dicey venture. They succeeded beyond what must have been their most optimistic projections. From left to right in the photo are Bart Andeer (President of the Suncoast Audiophile Society and of Resolution Acoustics), Ammar “A J” Jadusingh (owner of Soundfield Audio), AnalogPlanet editor Michael Fremer, Mike Bovaird (proprietor of Suncoast Audio, a Sarasota high end store) and John Chait (a longtime DIY audiophile and member of both the Suncoast and Sarasota audio clubs).